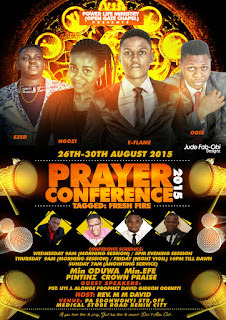 Power Life International Ministry (Open Gate Chapel) is here with their yearly "PRAYER CONFERENCE" tagged "FRESH FIRE" The conference that will be holding in Benin City (Edo State) will feature: The word from the Bible, Music, Deliverance, Drama and many more..
Friday 10pm till Dawn (Praise Night) Vigil. Venue: 22, Pa Edonwonyi Street, off medical store road Benin city Edo state. Music By: Ngozi, Min. Ogis, Min. Ezed, Min. Oduwa, Min. Efe, Pintinz, Crown Praise, E-flame, Power Life Choir, and many more..